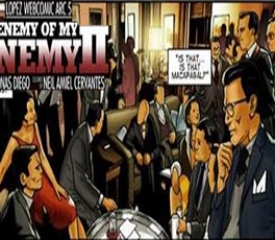 Enemy of My Enemy II, Arc 5A celebration of a hard-earned victory is how the latest installment of the Lopez webcomic series began. But just as the gathering commenced, an unexpected twist starts to unfold. 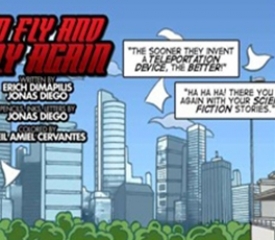 The air got filled with tension so thick you can cut it with a knife as the hero of our story, business magnate Eugenio “Eñing” Lopez, Sr., gets a surprise visit from none other than former President Macapagal himself. 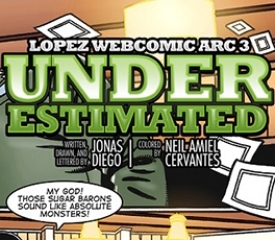 With Arc 4 ending on a bad note for Macapagal, one can only guess what business he has for his once most hated adversary. What reason imaginable motivated Macapagal to risk making an appearance at a place filled with supporters of his opposing party? Was he there to fight once more, or for something else entirely? What role will Macapagal play on the next chapter of the thrilling recount of the historic milestones unearthed from the Lopez archives? 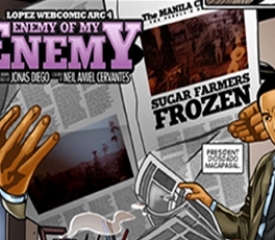 Discover this and more in page 1 of Enemy of My Enemy II, Arc 5 of the Eñing at Heart Lopez webcomic series.